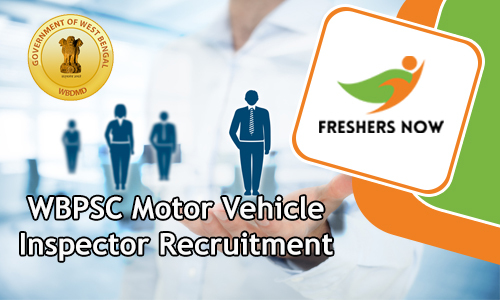 WBPSC Motor Vehicle Inspector Recruitment 2019 Notification is out. Through this advertisement, West Bengal Public Service Commission officials clearly circulated the specifications that an individual need to possess at the time of applying for the 74 Motor Vehicle Inspector Vacancies. Apparently, the officials are looking for the Candidates, who finished their 10th Class or Diploma from any Recognized Institute or University in India, as the Educational Qualification. By 17th February 2019, all the individual have to submit the application form if they are interested in the available positions. If you are willing, you can even check more other West Bengal Government Jobs, on our site Freshersnow.com. Here is the total information about the Newly released West Bengal Public Service Commission Recruitment 2019 Notification. Well, here in this section we are providing a table. And that table consists of total information that a contender should know before they are proceeding to submit the application form for the Motor Vehicle Inspector Vacancies. So, without skipping, try to check that out. Also, it is very important, for the Candidates, to have all the Qualifications correctly, as of the time of applying for the WBPSC Recruitment 2019. Apparently, the contenders, who are willing to apply for the WBPSC Motor Vehicle Inspector Recruitment 2019 should have finished their 10th Class or Diploma from any Recognized Institute or University in India, as the Educational Qualification. Now, the candidates, need to have the correct age limit. Contenders age must lie between 18 years to 39 years. For age relaxation check advertisement. Contenders need to clear the following rounds, to get placed in the organization. Selected Candidates are going to get a salary between Rs.7,100 to Rs.37,600/- Per Month, as the Salary. Hope the total information we shared about the WBPSC Motor Vehicle Inspector Recruitment 2019 is helpful. WBPSC Motor Vehicle Inspector Recruitment 2018-2019 Notification is out on 27th February 2018. Now, all the people who are looking for the Government Jobs in West Bengal state, particularly, WBPSC Jobs, can use this chance. So, apparently, there are a total of 234 Motor Vehicle Inspector Vacancies. And all those interested candidates, soon after checking the details, should submit their filled application form at www.pscwbapplication.in on or before the Final date. In the official WBPSC Motor Vehicle Inspector Recruitment 2018-2019 Notification, the officials took the liberty and mentioned the complete information. Now, all those people who are having the correct qualifications should submit their filled application form by 19th March 2018. After that, the West Bengal Public Service Commission officials are going to reject the late Applications. Now, the officials mentioned in the advertisement, that they will see some requirements in the contenders while going through the submitted application forms. Now, we are going to list out all the important requirements that are mentioned in the official WBPSC Motor Vehicle Inspector Recruitment 2018-2019 Notification by the officials of the West Bengal PSC. So, now according to the information in the Official WBPSC Motor Vehicle Inspector Advertisement, the officials are looking for the candidates, who had finished their Must have passed Madhyamik examination or its equivalent examination/diploma in automobile or Mechanical Engineering from a recognized Institution or University AICTE/WBSCTE or its equivalent as the educational Qualification. Along with the Education requirement, the WBPSC Officials also mention that they are expecting the candidates to have had a minimum of two year’s experience in a Workshop/Factory of Automotive O.E.M. (Original Equipment Manufacturer) or O.E.M.-authorised Workshop / Service Centre duly registered by a competent Government/Local Body Authority. Along with the Must possess a Driving Licence for heavy vehicles. Please find some basic and important details from the above-given table. You all can explore it and find out about the WBPSC Motor Vehicle Inspector Recruitment 2018-2019. Now, after the Requirement of Education and Work experience, the officials are WBPSC are looking for the correct Age. According to the information given in the official advertisement, the minimum age can be 18 years. And the maximum age is limited to 39 years. And this should be as of on the 1st January 2018. Also, for age relaxation stuff check the advertisement by the WBPSC attached at the bottom of this article. Now, please find your way to the next sections of this post. And get more important details. So, Now, all those people who are in deep Job hunt can use this chance for getting placed in a reputed organization like West Bengal PSC. Remember that you need have had all the qualifications correctly, as of on time of applying. If not the officials of the West Bengal Public Service Commission are going to reject such applications. Now, many of the people might be wondering about the information related to the WBPSC Motor Vehicle Inspector Recruitment 2018-2019. But many of the candidates might have no luck in getting the correct information. Therefore, for all such people, here we are creating this new post, with the total data given in the WBPSC Motor Vehicle Inspector Recruitment 2018-2019 Notification by the officials. So basically, this WBPSC Motor Vehicle Inspector Recruitment 2018-2019 is announced by the WBPSC Officials. We are just giving the details on this page. According to the Recruitment Advertisement, candidates have to pay Application Fee. So, WBPSC officials mention that the applicants should pay Rs.160/- along with other internet handles and Convenience Fee. In this, the SC, ST people along with the PWD’s are exempted. Before paying the application fee, consider in rechecking the advertisement twice. Now, remember that to pay the application fee, the official kept a deadline. Therefore, before that person should make the payment. And those applications from candidates who paid the application fee are considered only. Now, after the good verification of Application forms, the officials will invite the contenders, to take part in the Recruitment Rounds. Remember the fact that you have to clear these rounds to get the Job as Motor Vehicle Inspector. More information is available in next sections of this post. Now, as mentioned above in this post. All those people who will apply for the WBPSC Motor Vehicle Inspector Recruitment 2018-2019 should notice them. And have to prepare according to them. So, that they can easily clear the Rounds. Eventually, they can get placed. So, apparently, those people who will submit the application form before the final date should participate in these rounds. Written Examination along with the Personal Interview is the Selection rounds. You will go the next round only if you clear the initial rounds. For that purpose, you have to prepare well and hard. Even you can find the preparation materials on our site. So, those people who will clear the Selection rounds and get the job as the Motor Vehicle Inspector will get the pre-mentioned salary. The officials of the WBPSC mentioned in the official WBPSC Motor Vehicle Inspector Recruitment 2018-2019 Notification that the appointees will get Rs.7,100 to Rs.37,600 per month. Along with the Grade Pay of Rs.4,100/-. Please check the next sections, through which we have tried to covey the important information clearly. So, the candidates should have Minimum of two year’s experience in a Workshop/Factory of Automotive O.E.M. (Original Equipment Manufacturer) or O.E.M.-authorised Workshop / Service Centre duly registered by a competent Government/Local Body Authority. Along with the Must possess a Driving Licence for heavy vehicles. Rs.7,100 to Rs.37,900/- Per Month along with the Grade Pay of Rs.4,100. So, all the interested candidates can check the following points to apply for the WBPSC Motor Vehicle Inspector Recruitment. Therefore, follow the following points. So, foremost of all check the official portal of the West Bengal Public Service Commission portal at pscwbonline.gov.in. Check for the WBPSC Motor Vehicle Inspector Recruitment 2018-2019 Notification. So, If eligible Download the application form from the www.pscwbapplication.in. So, we finally, hope all the details given about the WBPSC Motor Vehicle Inspector Recruitment 2018-2019 Notification are satisfactory for you all. For more such information, come back to our site Freshersnow.com daily.